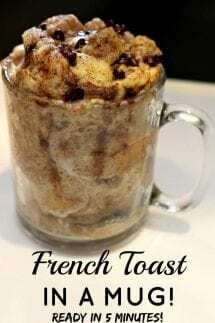 French Toast in a Mug a is quick and easy breakfast that will be a new family favorite. Only dirty one dish and it is ready in 5 minutes! Your kids will beg for it! You can make the single serving French Toast Mug for yourself, or make mugs for the whole family. We adore quick and easy breakfast ideas! This is one of our favorites! However, if you are looking for others be sure to check out our Nutella French Toast Roll-Ups and our easy to make bacon, egg and cheese bites. Making meals in a mug just may be my newest obsession and this French Toast Mug is where it all began! My son, Joey, and I saw a video on the Food Network on how to make 3 quick and easy meals in a mug. 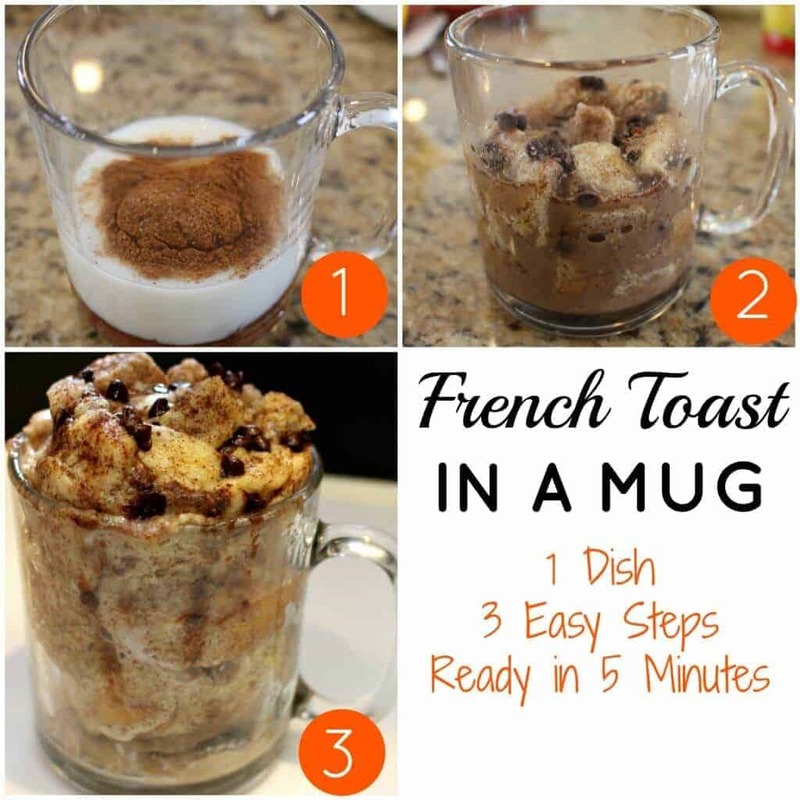 We could hardly wait to try to make our French Toast Mug. Let’s just say this recipe speaks to me – First of all, it’s one dish (mug) to clean up. Second, it’s done in 2 easy steps. When all is said and done, I get a breakfast my kids are begging for more of rather than leaving leftovers. This is also great for making French Toast for 2…. use two mugs! However, sometimes you may just have a french toast craving, but no one else is on board with that (go figure). In that case, this single serving French Toast Mug is the perfect solution! 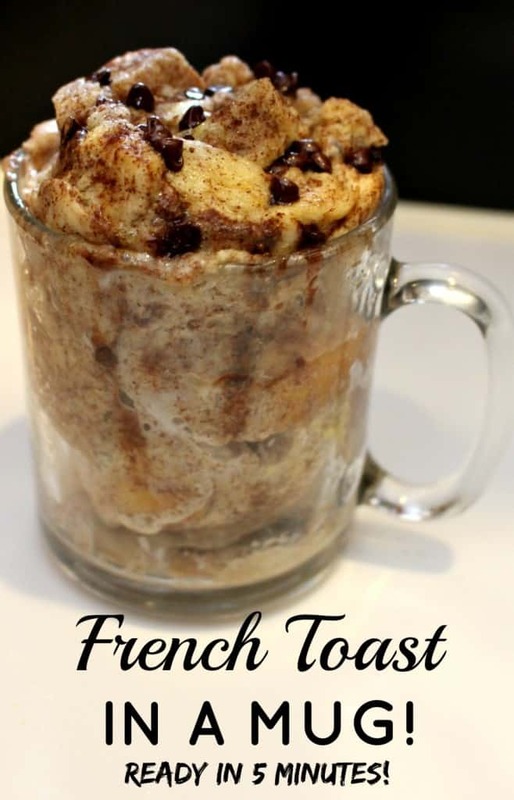 If you love French Toast, then you will go CRAZY for this quick French Toast recipe in a mug! We adjusted the Food Network’s recipe slightly and I totally recommend using challah bread if you can – the sweetness of the bread just enhances the deliciousness!! These are both total keepers! I am telling you, this will be your new favorite weekend recipe! The egg bread mixture, with the hint of cinnamon, all warmed up and ooey gooey, will have your kids begging for it! It is such an easy french toast recipe. Yet, without the hassle of making french toast! Do you love french toast too? If so, our Nutella French Toast Roll-Ups puts a delicious twist on regular french toast! You must try these too! Like we said, this is the easiest french toast recipe ever! It literally takes less than five minutes. 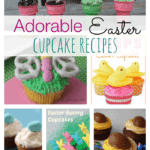 See our video below or print out the full recipe! 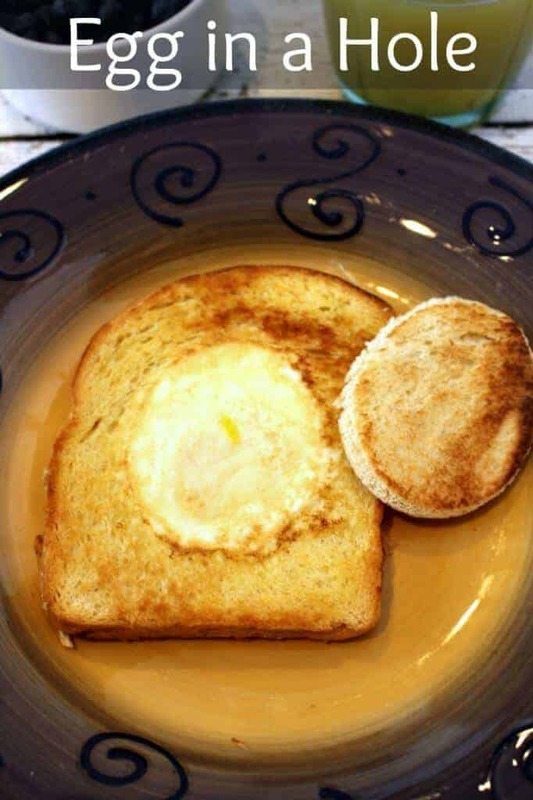 French Toast in a Mug is quick and easy breakfast that will be a new family favorite. It only takes on dish and is ready in 5 minutes! Your kids will beg for it! 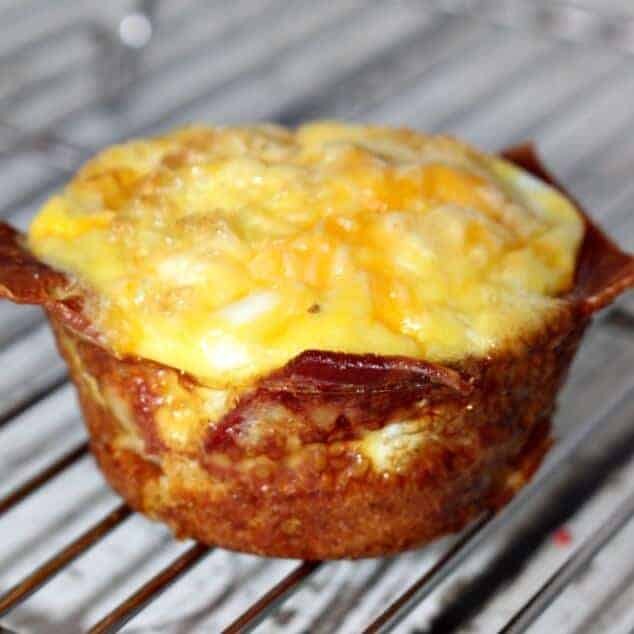 These Bacon, Egg and Cheese Omelette Bites are a huge hit and can be refrigerated for a quick and easy school day breakfast! They’re still just as good! If you need a great brunch recipe for a crowd, then this is my go to brunch recipe! 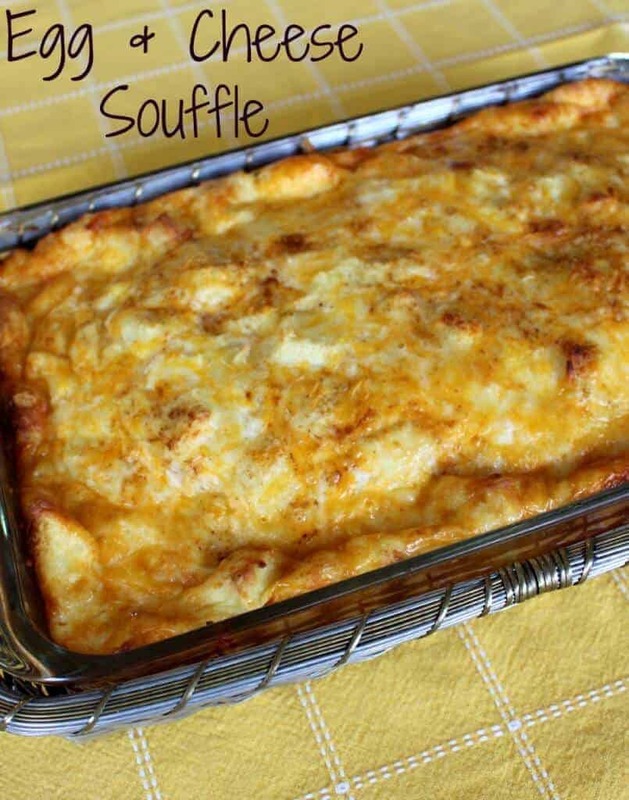 This egg and cheese souffle can be prepared the night before. Then bake it in the morning right before your guests arrive! I tried this recipe along with other mug recipes, but I keep on having this issue with the meal being really moist, and not really bread-y? Any advice? Hi Sammy – the bottom of the mug is for sure moister than the top (although the top for me is not). You can try giving it a stir when you stop the microwave to let it rest? Hi is this a trim healthy mama recipe? I’m going to make it into one in the morning. I’ll use nuke queen bread, truvia and almond milk. I made your recipe foe french toast. Delicious!! I live alone and this is something I can make just for me. Thanks. Now I will try most any recipe with your name on it. It was that good. Billie G.
Thanks so much!! You made my night!! This sounds & looks delicious. Is a mug with a 2 cup capacity sufficient size for this? Oh my!!! I am totally smitten with this! I made it as soon as I read it because I was hungry, it was morning and I wanted something good and quick. I used a couple of bite sized dark chocolate bars and three caramels in mine. It was awesomeness!!! Cooked perfectly, the hardest part was letting it cool enough to not burn my tongue! I followed the cooking instructions exactly too.??? If I want to make this for my family, do I need to cook them one at a time in the microwave or can I cook 2 or 3 at a time. Would it change the cooking time? Hi! I usually do one at a time. I haven’t tried more than one! What the heck kind of a breakfast is that? You call that breakfast? Chocolate chips , syrup and white bread.. Fast, non nutrient carbs that wreck havoc to your blood sugar, the kids will come crashing down after an hour. The only thing good in that is the egg and maybe the milk. That’s not breakfast, that’s dessert.! Smh. ? Let people live their lives geez if u don’t wanna eat it then don’t make it and get off their page lmao it’s not that hard, smh. This was awesome. It seemed to me basically microwave bread pudding, which I loved. I had some mostly stale cinnamon bread and half and half in the fridge that I have been trying to use up, so I used some of both of those to make it even more of a treat. So good. The liquid turned all sweet and custardy. I added some raisins and a little more cinnamon and it was spectacular. 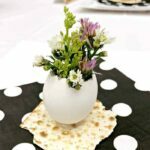 Chex Mix Recipes for Every Occasion!